The B.C. 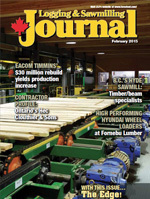 forest industry continues to bounce back, getting fuel for its recovery from a lower Canadian dollar and increasing housing starts in the U.S., but there are still pressing issues to be discussed at the upcoming Council of Forest Industries (COFI) annual convention in Prince George in April. Attendees at the upcoming Council of Forest Industries (COFI) convention being held April 8-9 in Prince George, B.C. can get a first-hand look at one of the topics on the program—the use of wood in higher buildings—by taking a short walk to downtown Prince George. There, they can see the Wood Innovation and Design Centre (WIDC) in downtown Prince George. The building utilizes a number of wood species and products from across the province such as Douglas fir, western red cedar, hemlock, pine and spruce. The WIDC incorporates a structural system that includes a variety of locally manufactured solid engineered wood products. And at 29.5 metres high with six floors, it is the tallest contemporary wood building in North America. One of the topics at the COFI two-day convention in Prince George is Showcasing Wood Promotion & Use, during which the WIDC is sure to be discussed. “Over the decades, the industry has built up a very good reputation and captured well the single family and low-rise multi-family market,” says Doug Routledge, vice-president forestry and northern operations for COFI. While this market segment will continue to be large, the use of wood materials in taller structures, such as the WIDC, is gaining momentum, he says. Another trend to be discussed at the conference is the development of passive houses, which have high levels of energy efficiency. With their higher levels of wood use, this represents another potential market for wood producers. While the conference will certainly be looking at current industry trends, it will also be looking out into the future, where the industry will be in five years’—or even 20 years’—time, says Routledge. There will be a focus on three main areas: fibre supply, markets and product lines. Product lines include newly emerging bio economy products, such as wood pellets and engineered wood products, in addition to traditional products, lumber and plywood. The convention will include a panel on transportation, so essential to the industry. “We need to get our wood products to the marketplace, whether that means using ships, the ports, rail or trucks, and that is a bit of a hot button for the industry right now,” says Routledge. Improvements could be made on the rail transportation side, he added. One of the sessions deals with relationships with First Nations, and the changing situation in dealing with First Nations groups. A focus of this session will be on what works, says Routledge. Fibre supply will also be discussed at the convention. The issue of safety and dust control is sure to be discussed at the convention. “We’ve made huge strides in that regard,” says Routledge. “I think we’ve built a good solid foundation. We had those catastrophic events a couple of years ago, and certainly the dust side has been very prominent and very active.” Routledge added that safety efforts in the industry have a broad scope. COFI will be re-introducing its community engagement program at the 2015 convention. The forest industry has enjoyed a long and close relationship with the leaders of the communities in which its members operate. Past conventions have featured the opportunity for elected representatives to meet and engage with business leaders, and the program will be re-introduced this year. While there is a very solid line-up of speakers and topics, the value of the COFI conference is also in informal networking that’s done at lunches, dinners and during coffee breaks, between industry people. “That has huge value,” says Routledge. With the development of electronic communications such as e-mails, texts and tweets, getting together with people, face-to-face, is more important than ever, he added. The high level of interest in the COFI convention reflects the continuing recovery of the industry from the downturn, though it has been a slower recovery than many industry people expected. “That is not necessarily a bad thing,” says Routledge. “The slowly evolving recovery is actually leading to a greater degree of industry stability in the long run. “Rather than a quick flash in the pan recovery, where industry people might think that they don’t have to finish off that project or cost saving measure because the cash is flowing again, the slower recovery is resulting in people seeing things through, whether it is on the technology and innovation side of the mill, helping government modernize public policy, the fibre supply side or new product innovation. “But the recovery has been more muted than expected, and consequently the industry has been a little more guarded about spending capital,” said Routledge. The industry remains very aware of the importance of its export markets, whether it is the Pacific Rim or the U.S., and the value of diversifying markets, both geographically and in products. Export markets are the lifeblood of the industry, says Routledge, noting that the domestic market in Canada does not even consume 15 per cent of the lumber produced in B.C. alone. Overall, the industry is, as the saying goes, cautiously optimistic, added Routledge. 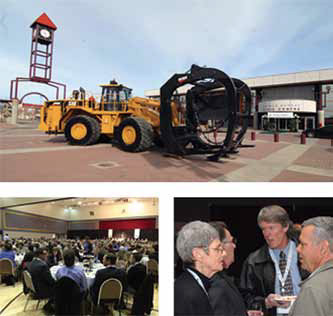 The Council of Forest Industries will host its annual convention April 8-9 at the Prince George Civic Centre in Prince George, B.C. As has come to be expected of the pre-eminent forest industry conference in Western Canada, this year’s program will feature opinion leaders speaking on the issues that matter to the forest industry in B.C., including markets, fibre, products, and competitiveness. The COFI Annual Convention is the largest annual gathering of the forest industry in western Canada and attracts industry CEOs, vice-presidents and operations staff from continental North America and offshore, senior representatives from customers, suppliers, financial institutions, law firms, consultants, local government, chambers of commerce, federal and provincial ministers, MPs, MLAs, senior civil servants and students and instructors from trade, technical and university post-secondary institutions. Historic attendance at the convention ranges between 500 to 900 registered delegates. An updated schedule for the convention is available online, at www.cofi.org/convention/annual-convention.